This is one of my all-time favorite quotes. I think Mr. Haugen is absolutely right. There are many important decisions that come with the gift of humanity, but the choice between being safe or brave is one of the most consistent, and its the one that arguable shapes and re-shapes the course of our life over time. I love this quote for another reason as well – it goes hand in hand with the name of our church “River City.” I’m often asked what the meaning is behind the name, and I have to sheepishly admit that the origins of the name was not rooted in anything particularly significant. The honest truth is that it was just one of many contenders, and when we couldn’t find a name we liked we picked this one by attrition. But over time that changed. If I would have paid more attention to the Bible I would have discovered that both “River” and “City” are powerful motifs in Scripture. In fact, both words are found in conjunction in the very last chapter of the Bible. Revelation 22 portrays a prophetic picture of the power of God at work (sorry, the alliteration with “p’s” was accidental ;)). Here the Apostle John has a vision of a mighty river flowing from the throne room of God down to the city, and everything that the river touches comes to life. The proof of life is found in the fruit of the trees, which bring healing to all the nations. When the River of Life begins to transformationally flow into the city, it begins as a mere trickle. Ezekiel says it starts “ankle-deep.” This is an interesting note, because I think it gets to the continual choice that we all face between safety and bravery. 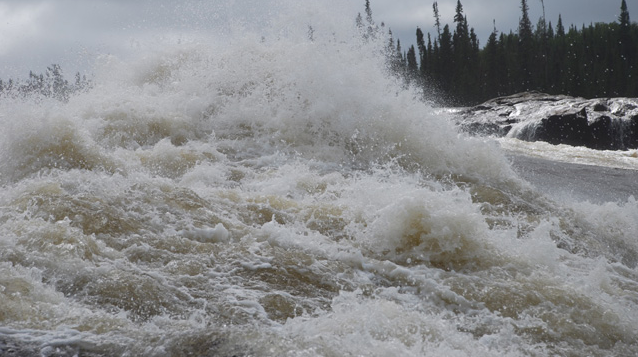 When you step ankle-deep into a might river, who is in more control – you or the river? It may require a small dose of bravery to step ankle-deep into a rushing river, but at the end of the day you are still in control. Safe takes precedence over brave. In the vision the water then progresses in power, and it rises to the point that it is knee-deep. Greater levels of bravery are now required, but safety is still clearly winning. Finally the river rises to waist-level, and this is where faith gets really interesting for most of us. It is waist-high faith that is the most dissatisfying in the entire spiritual experience (in my humble opinion). When a person takes waist-high risks in trusting God and relinquishing control, they are certainly exercising a certain amount of bravery. And yet ironically, the fact that they are only waist-high shows that they are still grasping at some level of control. If that weren’t the case, why not just jump all the way in? This half-in/\half-out form of faith is the kind that gets so frustrating so quickly. When you are waist-high you are deep enough in to feel the mighty currents of the river. The power is electric, and everything in you wants to just let it take over. Yet you can’t, because the need to have some sense of control over your environment still looms strongly. It is waist-high faith that gives us glimpses of the glory of God, yet frustrates us to no end because we can’t quite let go. If the choice is between safety and bravery it’s nearly a tie. But in this game, a tie goes to safety, not bravery. It’s at this point of the vision that the game changes for Ezekiel. Now the River of Life rises to the point that the choice between safety and bravery is no longer fuzzy. Now it is a river that he cannot cross. It is deep enough that the only way to travel in it is by swimming. Safety can no longer be the primary objective. If he is going to experience the power of the River, then he must fully surrender to it. The choice is clear. It’s brave or bust. But that’s the catch. Life doesn’t come from us – it comes from God. And if we want to be human beings that are fully alive, then we must become comfortable with the fact that the road continuously takes us through the intersection of fear and faith. We can choose to be safe, or we can choose to be brave, but we can’t choose to be both. I wish at this point I could promise you that choosing brave translates into easy and comfortable, but that’s just not the truth. A powerful river is dangerous. There are moments when you go under water, and you’re not sure when you’re going to come back up. There are moments when stuff erupts out of you that you either didn’t know was there or wished wasn’t. There are moments when you crack your head against a rock on the side, and you can feel the impact in ways that you didn’t. So why do we do it? Why do we choose bravery over safety? Because it is only in the River where we are fully alive. Because it is only in the River where we become men and women of courage and nobility. And most importantly, because it’s only in the River where we meet God in powerful and intimate ways.